Displays brilliantly on mantle, bookshelf, etc. Great for collectors, history buffs, etc. This replica of ancient weaponry features a 10" blade constructed from stainless steel with double edge styling and teeth like serrations. 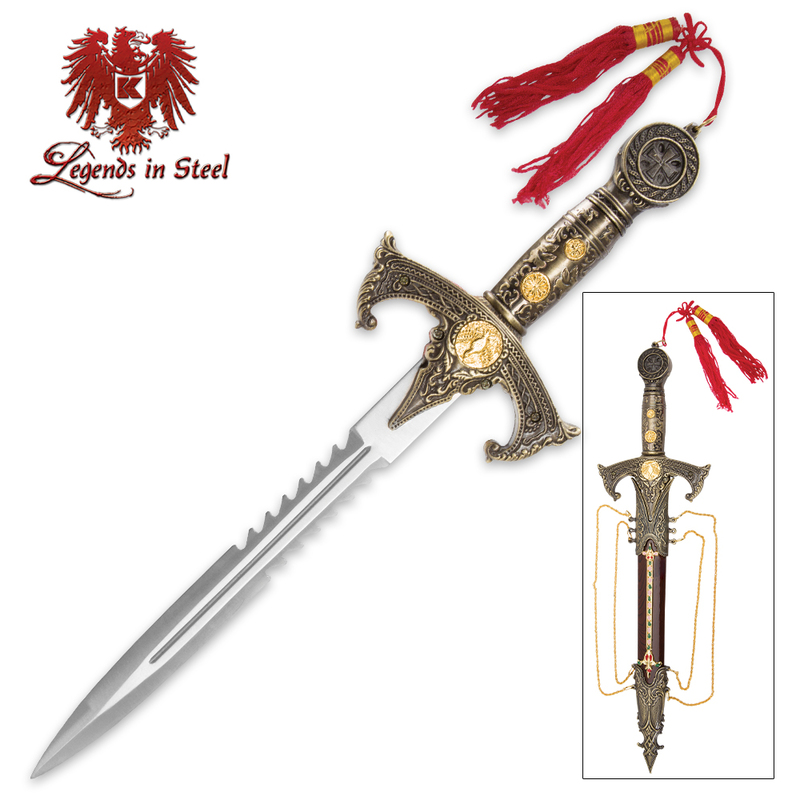 The cast metal handle is brass plated with ancient medallion symbolism and crimson tassel. 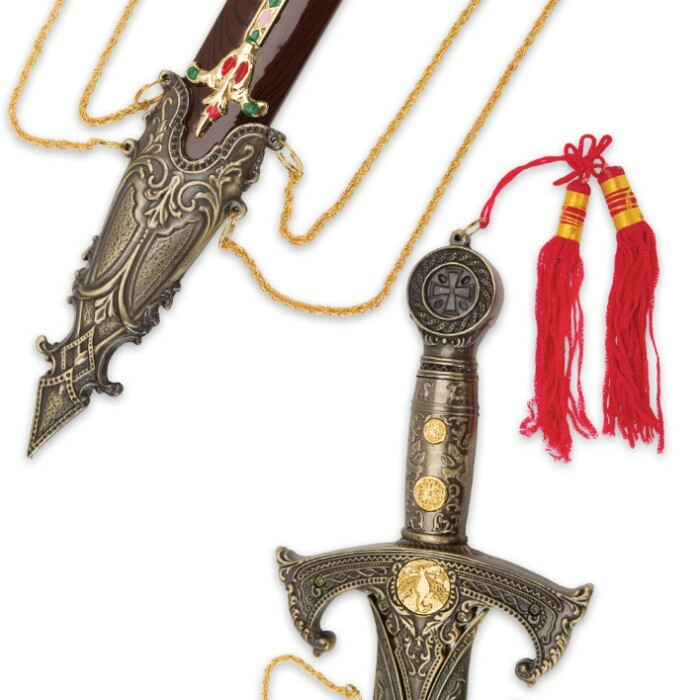 The matching blade scabbard is finished in a lacquer overlay and brass plated tips with accenting metal chains. 15" overall. Everything about this dagger is great. Is is very remnescent of the time of the Templar. I recommend this dagger. the handle is solid but screws showing that holds it together not good for show/display imo.scabbard/sheath was the worst part of it all those cheap gold chains hanging and tangling up everywhere fake plastic wood pieces and those 2 fake gold multi colored pieces on each side of the scabbard/sheath that don't fit right and rattle if left on.alot of metal over molding issues on the scabbard/sheath and handle to.out of 6 daggers I got all in this 1 order this 1 was the highest priced and felt the cheapest by far imo.this dagger cost me 13 dollars and is worse quality imo then the cheapest dagger I bought for 6 dolars the robin hood dagger.ill give 2 stars bc the handle is solid and the blade is nice imo.well that's it have a good one all. 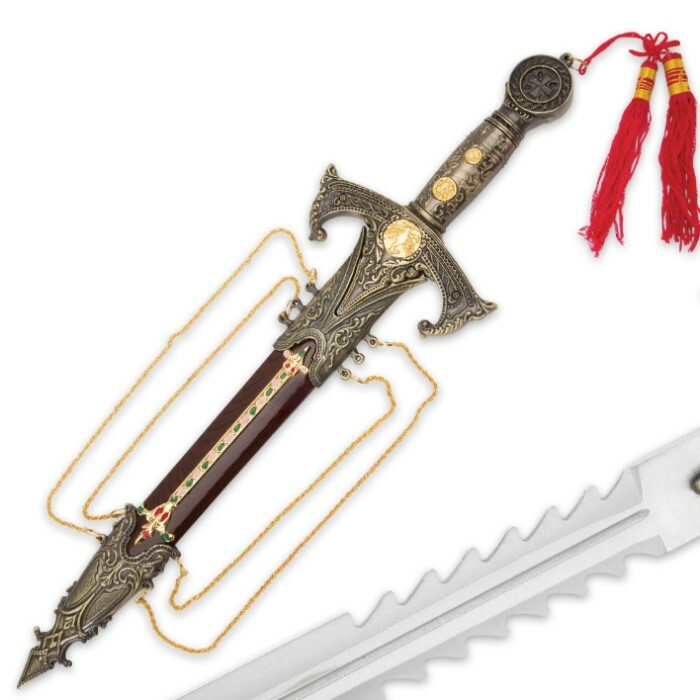 Its Fancy, the blade, the sheath, and the color accents Make this a very fancy dagger. Not forgetting the golden chains on the side. The blade comes semi-sharp, but still intimidating. Pretty cheap considering what you would pay at other sites. The colored stripe down each side of the sheath is lazily painted, at best, and on close inspection, was actually painted "out of the lines". There is even paint on spots ther should not be, like splattered on the arrowhead at each side. The red frill on the end does not last if moved around much, as it will become frayed, and worn out extremely quick. In the end, it is a Very fancy dagger, as long as you dont try to find fault in it. and it took me awhile to find the painting problem, so if someone just comes up to look at it, they'll only notice how beautiful it is. And i suggest hanging it up on your wall at a 45~degree angle, as this will make it stand out greatly. I do suggest this knife to anyone looking for a golden-red accented dagger, as this fits, and it not expensive on top of that. If you dont mind little things, this is a good dagger for you. This turned out to be pretty sweet! It's nice and small, ok point on it and sturdy enough. Little tough to pull out of sheath but nothing terrible. Definitely an neat looking display piece. Loved it, it looks better than i thought it would. it is kinda hard to pull out of the sheath and where the blade rubed on the way out there was some metal fragments. all and all it was worth the money. Great dagger! Nice sharp blade strait out of the box!! The packaging was done poorly but no damage was inflicted on the dagger. The only thing is that they make the lining on the case look gold but its all colored. But overall excellent weapon great quality! I recieved this dagger 3 days after placing the order! The packaging was done poorly, but thankfully there was no damage to the dagger.A tiny piece of the sheath was a little loose, but fixable. The blade is quite sharp and can easily pierce through the box it comes in! Overall this is a great addition to anyone's collection and definetly worth it.